Are you planning a farmhouse laundry room makeover? You’re going to love this modern farmhouse laundry room design board. 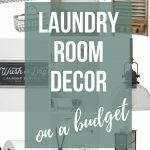 I’ve also rounded up some super cute (and budget friendly) laundry room decor ideas at the bottom too! We are full steam ahead with our next renovation project over here – the laundry room. 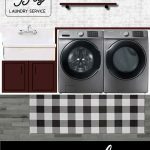 We’re giving our boring and outdated laundry room a fresh, modern farmhouse makeover with lots of DIY projects (that will be easy for you to replicate in your own laundry room design I promise). 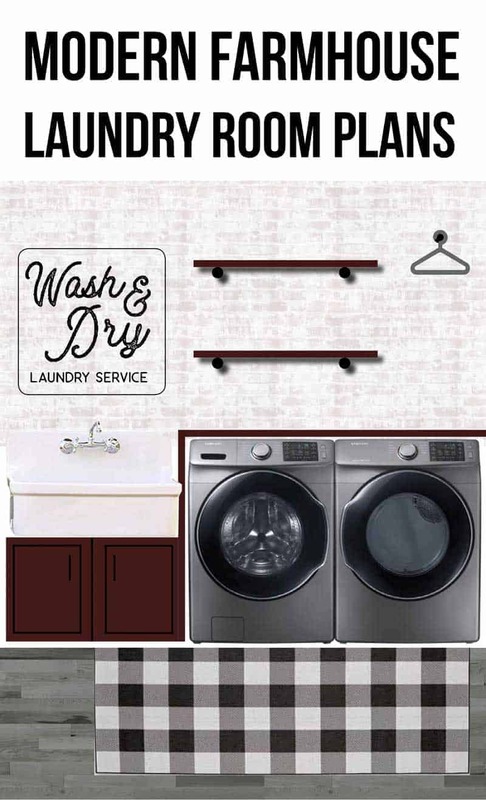 Today I’m sharing all of our laundry room design plans and giving you a glimpse into what we were starting with for the before pictures. So, this is what the room looked like when we moved in (hence the empty room with no washer and dryer or anything). Just so you get any idea of the lay of the land…the door with the carpet in front of it leads to the garage, the small room behind where the washer & dryer goes is a SUPER small bathroom (the only one on this end of the house), the opening with the steps down leads to our living room and the cased opening leads to the kitchen (and the other end of the house). Unlike most people, our laundry room is seen by pretty much every single person that comes into our house. If they go into our kitchen, they have to walk through the corner of the laundry room to get there. And if they use the bathroom, it is in here too. 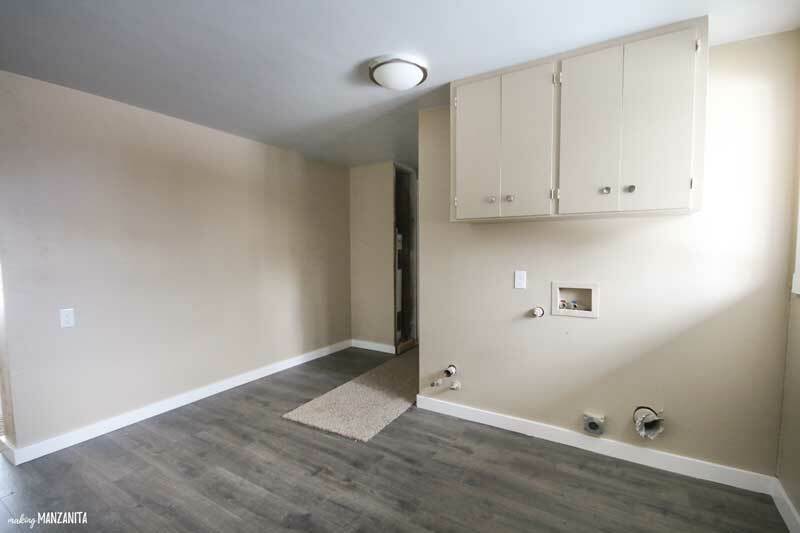 Also, looking forward into the longer term plan for our house….eventually the other half of our laundry room will become an office area (after this room gets closed up and doesn’t serve as a “hallway” to the kitchen anymore). 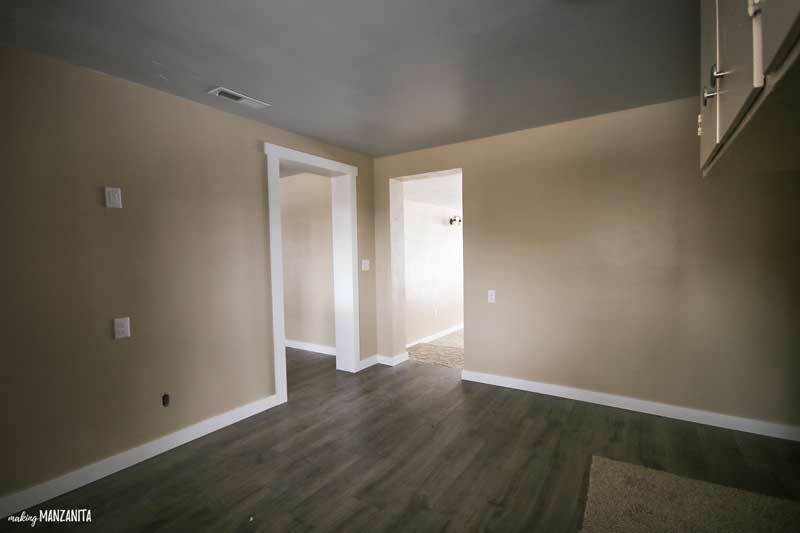 One of the renovation plans we have for our house is to knock out a bedroom to create an open concept between the living room and kitchen (read more about our renovation plans for our fixer upper here). 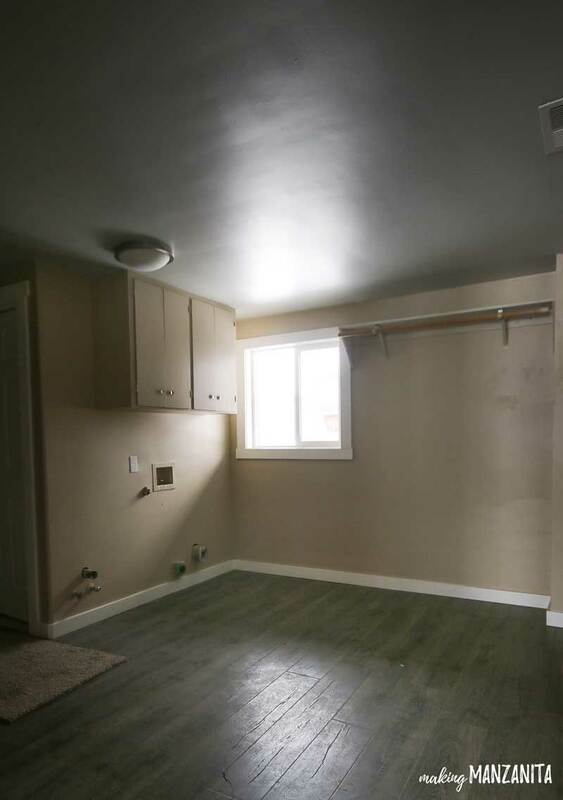 Once we do that project, we won’t need this laundry room to be open to the living room and kitchen, so it will make the perfect office someday. 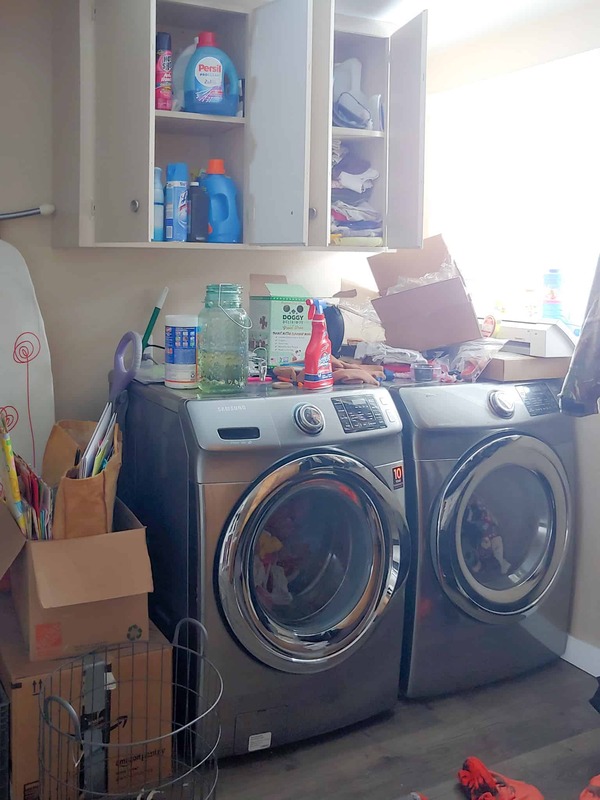 Alright, so now I’m really going to “air my dirty laundry” (pardon the pun, hehe)…..this room had really become a dump all area and embarrassingly enough – this is how the laundry room looked just a few weeks ago when we started the laundry room renovation. Please don’t judge me too hard. It ain’t pretty, but that is the reality. Now you know why I am so freakin’ excited to get the show on the road with this renovation project, right? Ready to see our farmhouse laundry room design board? This is probably what I am most looking forward to in the laundry room. We’re going to remove the upper cabinet and cover the wall behind the washer and dryer with faux brick panels and then give them a fun german schmear treatment with joint compound. I’ve ALWAYS wanted to try doing german schmear and love that these faux brick panels are going to make this project super affordable. Don’t worry, I’ll get you a full tutorial of the project soon! Again, the industrial floating shelves I have planned for our laundry room design are so easy to replicate and really cheap! We are DIYing our own brackets with black iron pipe parts. They ended up being $10.57 each for the parts. Another option is to buy these premade brackets that look the exactly same but are cheaper than the individual parts. We were planning on using these, but they just didn’t have them in stock at our store and we didn’t want to wait for them to ship! For the top of the shelves, we are using oak wood stained with a dark wood stain. Full tutorial for the shelves coming up soon! We got the parts to make a 5th bracket just like we are making for the shelves and we’ll put it to the right of the shelves (near the window). This will be a great place to hang up a few shirts if they need to air dry. We have a gorgeous farmhouse sink sitting in our garage and it has been there since we moved in. Logan’s dad snagged it for SUPER CHEAP at a Restore in Southern California knowing that I love them. He wasn’t sure if we would be able to find a place for it, but it turned out being the PERFECT fit for next to our washer and dryer to be used as a utility sink. Thankfully, this project will be fairly simple because the plumbing is already ready to go in the wall so we don’t want to worry about that part – whew. Logan is going to build a DIY base cabinet for the farmhouse sink to sit on and provide some extra storage too. Next to the farmhouse sink cabinet, it will connect to a folding counter over the top of the washer and dryer. We’re using plywood with trim on the front for beautiful finished off custom look. One idea that came to me late one night while I was laying in bed (please tell me I’m not the only one that thinks up design plans when I’m trying to fall asleep) was to stencil a design on the faux brick wall above the sink. I remembered seeing something on Fixer Upper with a stenciled design on brick. After looking for the Fixer Upper house online, I remember just how much I loved this laundry room. It’s definitely as source of inspiration for our farmhouse laundry room. I am planning on designing & cutting the custom stencil with my Silhouette Cameo. This DIY project will be SO fun! 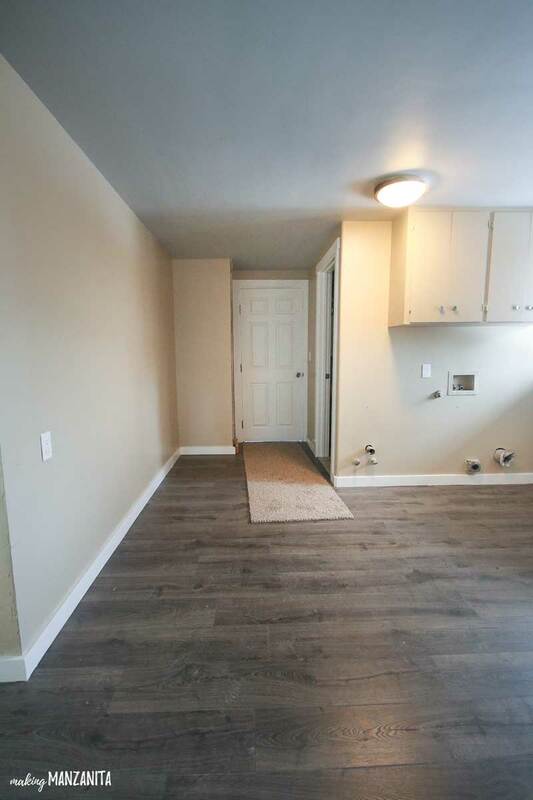 Last, but not least, I think adding a rug to the floor in front of the washer and dryer will add a lot of character to the room. A few months ago I accidentally ordered 2 of these buffalo check rugs instead of one – oops. I love the one we are already using in the corner of our living room in our kid’s play area. The best part is that this rug is technically an outdoor rug, so it can be hosed off it gets dirty and will air dry easily if it gets wet. This makes it a perfect rug to add to our farmhouse laundry room, don’t ya think? I am SO excited to get started on the renovations and can’t wait to take you alongside as we make this laundry room design come to life! Looking for more laundry room decor ideas? For adding some decor to the laundry room, I really won’t need much. I think the faux brick wall will add a lot of design and character to the room. Stenciling a design on the wall will provide built in wall decor, so that box is checked too. I will probably “shop my house” for some decor that I can move into this room from other parts of my house – like a few faux plants, hand towels, baskets for the shelves, etc. 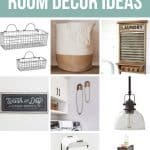 But if you’re looking for more farmhouse laundry room decor ideas as you come up with your laundry room design – I rounded some up here to inspire you a bit! 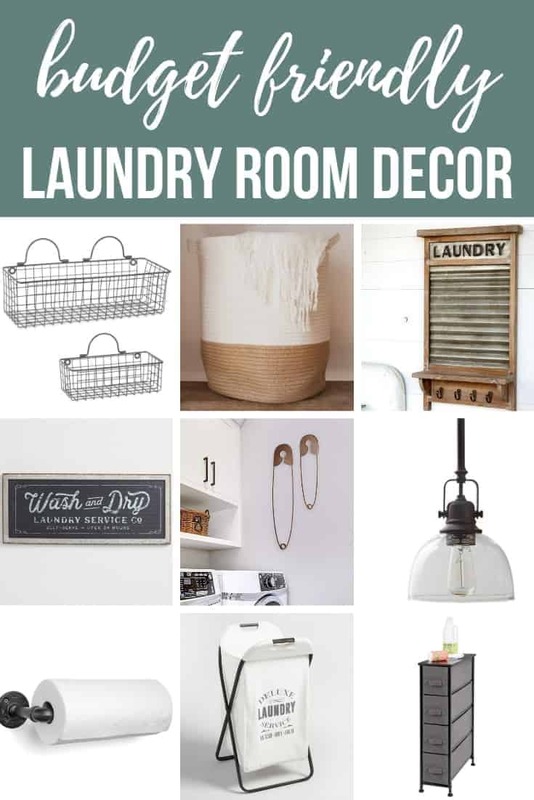 So many cute options for farmhouse laundry room decor, right?? I may grab one of those paper towel holders for the inside of the cabinet door. I think it would be super handy to have paper towels close by in the laundry room. Also, I totally wish we had a little wiggle room so we could add in those narrow storage drawers. Those look like they are SO useful. We have that laundry hamper and absolutely love it. We keep it in our master closet most of the time. Which of this farmhouse laundry decor do you like the best?? Did you get some inspiration for your own farmhouse laundry room design? ?